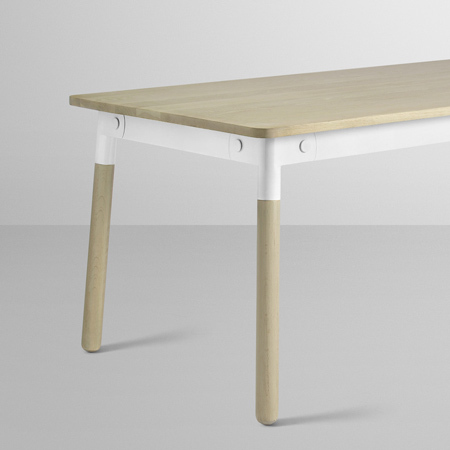 Swedish designers TAF have designed a dining table for Scandinavian design brand Muuto. Called Adaptable, the product is made of oak and powder coated steel. Consumers choose from four variations of tops, frames and legs. It is a true pleasure mixing things by yourself? With a choice of 4 different table tops, 4 frames and 4 types of legs there are 64 ways to create a personal and unique table. Adaptable table is made of solid oak and powder coated steel frame. Gabriella Gustafson and Mattias Ståhlbom have run the architecture and design studio TAF in Stockholm, Sweden since 2002. TAF’s aim is to make ordinary life less ordinary through subtle but effective changes in how products and architecture appear and function. A recurrent departure point in TAF projects is that everyday objects by their very commonness can be made uncommon. “The ordinary and standard as working material." "We are so used to the content of our daily life that it goes largely unnoticed. However, the common and everyday are actually what define us." "These are the objects that both influence and depict how we live. Perhaps it is the most insignificant and boring objects that are therefore the most interesting?" The Scandinavian design company MUUTO adds to the collection of innovative design with a new series of dining tables. The tables have been named Adaptable and are designed by the award-winning architect and design studio TAF from Stockholm. The two designers behind TAF Architects are Gabriella Gustafsson and Mattias Ståhlbom who has previously designed Muuto’s E27 lamp.